PHOTOS COURTESY OF KYM WATTS: Laneways, porches, and garages come alive with music during Seaton Village’s Open Tuning festival. 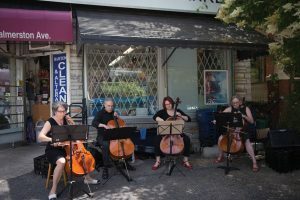 Musicians of all ages, genres, and abilities are welcome to perform during this community celebration, which is modelled on La Fête de la Musique in Paris. It’s only been six months since Samantha Wynter got her instrument, but she’s already playing her first music festival. “I got a guitar this Christmas, and Amelia taught me how to play,” explains Wynter, who together with Amelia Murphy-Beaudoin will perform as Heart Sass in Seaton Village this June. 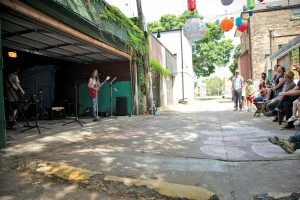 Now in its third year, Open Tuning is a daylong celebration of music that welcomes professionals and hobbyists of all ages to the myriad of makeshift stages on porches, in backyards, alleyways, garages, parks, and on street corners. Inspired by La Fête de la Musique in Paris, the festival opens with a parade in which children clang pots and sound noisemakers as they march through the neighbourhood to Vermont Square park. “You go down some alley at Open Tuning, and there’s that guy that you know from the grocery store, and he is playing a wicked bass,” says Jennifer Hunter, president of the Seaton Village Residents’ Association, a strong supporter of the festival. Sinclair anticipates that there will be approximately 90 acts performing from 15 official venues, and stresses the independent nature of the festival. Open Tuning is free of corporate sponsorship, volunteer run, and doesn’t cost a cent for the participants. The organizers treat all the performers, who are also volunteering their time, equally, no matter their background. That grassroots community atmosphere is part of what attracts professional musicians, which in the past have included Jane Siberry, Charles Spearin, and Feist (both from Broken Social Scene) to participate in the festival. “We had a little girl singing a song by Feist as around the corner Feist was performing,” recalls Sinclair. For Tim Odacre, a co-organizer who runs a stage dedicated to younger performers on his front porch, it illustrates how the festival breaks down all kinds of barriers and “makes performing music not a strange thing”. He says that while some kids are quite nervous — “a violinist stood up last year with two friends on either side” — most of the young performers “have quite a bit of fun with it”. Also appearing on Odacre’s stage are student bands from the King Edward Jr. and Sr. Public School rock band club. Music teacher Adam Platek says the festival gives the musicians aged 12 to 14 the experience of playing outside of a school function, as well as a little visibility in their neighbourhood. Last year Platek led a very popular open ukulele jam in the afternoon. “It was such a hit; kids wanted their own instrument after that,” recalls Odacre. He emphasizes how valuable the festival is for the community. “It’s connecting with neighbours through music,” which is one more way that Open Tuning breaks barriers: it brings together people who wouldn’t otherwise interact. As Spearin notes, “sometimes you need an excuse to meet your neighbours, and music is a really great reason,” though he admits that “I like anything that celebrates local talent, arts, community, and the neighbourhood”. It’s a sentiment that Christie shares. Open Tuning returns to Seaton Village on Saturday, June 11. The organizers, who pay for the festival out of their own pockets, have created a crowd-funding page to help raise money to offset the costs.